The Yankees have had trouble scoring runs this season — they rank thirteenth out of fifteen American League teams in that category — but their bats have broken out over the past two nights. After beating the Angels 14–7 on Tuesday, they beat them 11–3 last night for their fourth straight victory. How unusual are those kind of numbers for the 2013 Yankees? Until this week, they’d gone 58 consecutive home games without scoring double-digit runs. And leading the way has been Alfonso Soriano, who’s been historically productive over the past two games. Soriano also became the third player to drive in at least six runs in consecutive games since RBIs became an official statistic in 1920. The others were Rusty Greer for the Texas Rangers in 1997 and Geoff Jenkins for the Milwaukee Brewers in 2001. His thirteen RBIs over the past two games are also the second-most ever for a Yankee over a two-game span. 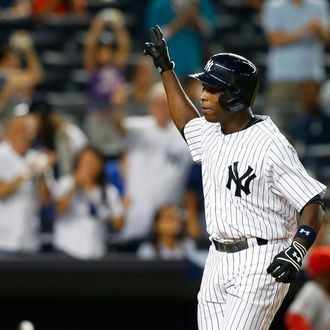 Of course, two games is a very small sample size, but Soriano’s numbers as a Yankee suddenly look pretty darn good: Through Monday, he’d put up an unimpressive .193/.220/.368 slash line in fifteen games since being acquired by the Yankees. Those numbers now, through seventeen games? A more respectable .258/.290/.606. Or, to play around some more with small sample sizes, he’s seen his OPS as a Yankee this season rise 307 points in two days. By the way, John Sterling — who’d been using a weak (and confusing) home-run call for Soriano earlier this season — has gotten his wonderfully insane act together. Below are the calls for Soriano’s two homers last night. Cue the singing!